An assortment of size 14 soft hackle wet flies tied by participants. Photo courtesy of Maria McMorrow. Fur, feathers, thread, and steel. These are the basic components that make up an artificial fishing fly, but it is the art and handcraft of tying these flies that that can take a lifetime to master. The 9 students and 2 leaders at Cobscook Community Learning Center’s (CCLC) River Camp got to try their hands at fly-tying with MOS's resident fly-fishing fanatic, Joe Horn. 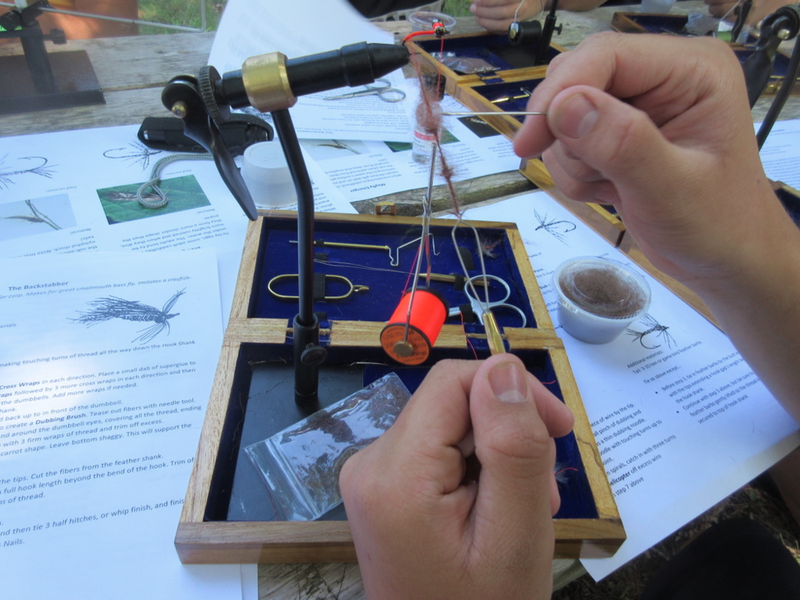 Each participant had the chance to tie 2 different flies: one was a soft hackle wet fly, and the other was called a Backstabber--so named for the way the fly rides upside down in the water with the point of the hook faced upwards. The soft hackle wet flies are a basic category of fly patterns which, in their most basic form use a single bird feather bound to a hook with silk thread. These so-called “soft hackles” can imitate a whole host of aquatic insects such as caddisflies, mayflies, and even stoneflies. In tying these flies the participants were able to learn the very basics of tying a fly: thread control, making a hackle (feather) collar, and finishing a fly. Working out the how to tie the complex Backstabber fly. Photo courtesy of Maria McMorrow. 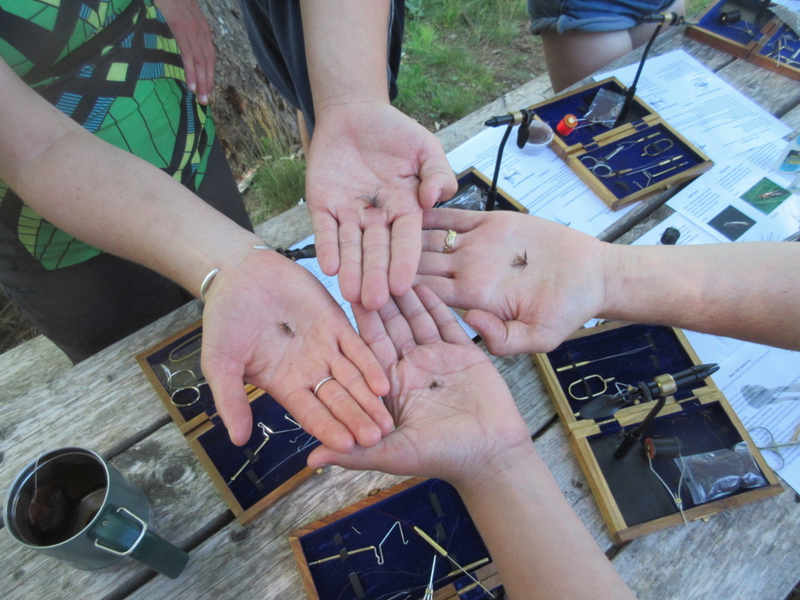 Equipped with the basic techniques of the craft of fly tying, participants moved on to tying the Backstabber. This fly was originally created by Jay Zimmerman in Colorado specifically intended to be used to fish for carp. This may seem an unlikely choice for a fly to tie in Maine considering our lack of carp, but the carp favor this fly due to its resemblance to one of their favorite food: crayfish. If carp and smallmouth bass have anything in common, it is their love for crayfish. With the River Camp being hosted on the banks of the Machias River, this seemed an ideal fly for the students to learn. After a little bit of time and a lot of concentration all participants were able to successfully tie both flies and even were able to catch fish on them that very afternoon when Downeast Salmon Federation Executive Director Dwayne Shaw taught them how to cast and fish with a fly rod! Do you know someone who would be interested in MOS programming? Learn more about our Educational Programs and contact us! You can also learn more about River Camp here. For more news like this, please sign up for MOS’s quarterly e-newsletter here.